This week’s #FashionFriday pays tribute to the unique Joan Rivers who made a lot of people laugh and supported many charities during her 50-year long career. Since Jonathan Adler redesigned the set of Fashion Police, Joan’s weekly dissection of red carpet appearances on the E Network, it’s been on my schedule to take a look at some of his designs in connection with the show and Joan Rivers during Fashion Week, but I was too late to publish it whilst she was with us. 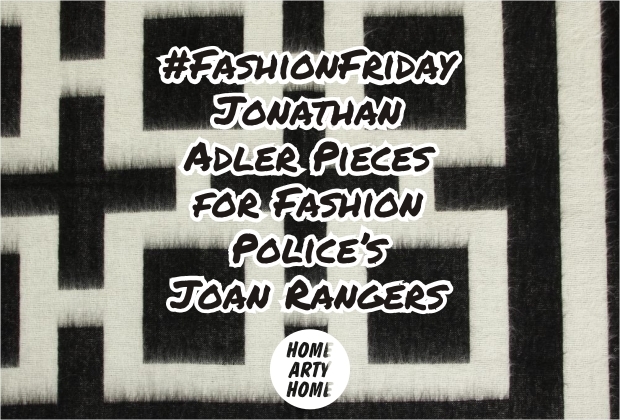 Jonathan Adler and Joan Rivers both share many qualities: humour, irreverence, edginess, individual style, and New York attitude, which made the Fashion Police collaboration perfect. To mark this sad week, I’m featuring a look at some Adler pieces I think Joan would have loved, and may well have even had in her rococo gilded ex-ballroom apartment in New York, the sort of place “Marie Antoinette would have lived, if she had money” to quote Joan. Firstly, she was a huge dog lover so it seems only right to take a look at adorable dog accessories; secondly, she was known for her quick & funny mouth, as well as her collagen-augmented lips, so I’ve included pieces with a surrealist pout; and finally, I’ve included the Black & White Nixon pattern throw and a black photo frame to reflect the Fashion Police set, and a New York cushion, her physical & spiritual home. Rest in Peace Joan Molinsky, you brought a lot of joy and laughter into the world.